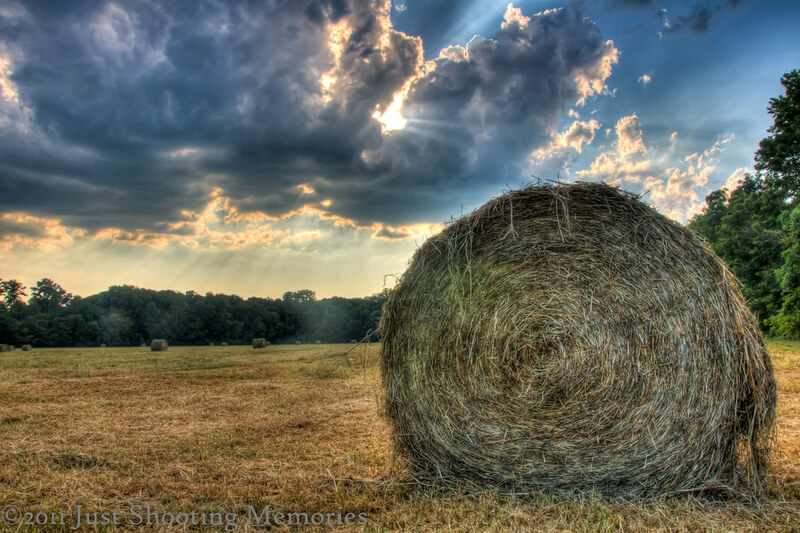 Changing Perspective / The Hay Bale | Just Shooting Memories! It is amazing how changing your perspective can change the look and feel of a photo. I have begun to look at subjects from every angle if I have the time. It helps to have a wide angle lens also, but a zoom lens can make for interesting shots with the right distance. I like the view when you get close and low to the ground. It makes the subject appear large and looming. However, if I back up just a little, it becomes less impressive and not as strong a subject. Changing your perspective can turn one subject into many photos. I took this photo the other day. I drove by this little field full of rolled hay bales. It appeared the hay had just been cut, at least within the last few days. There was short stubble all over the field. I did the photographers U-turn, went back to the field and had my wife drop me off. Surely I am not the only one who does this? I took a quick set of photos and exited the area. I have taken a few other photos with a close up perspective like this one of a Chopper. And don’t miss last Monday’s Daily Photo. Ditto. Good timing with the sun and clouds too. Thank you Kris and Tim. I have been wanting to make a hay bale my subject for a while now. I am just glad Everything came together when it did.